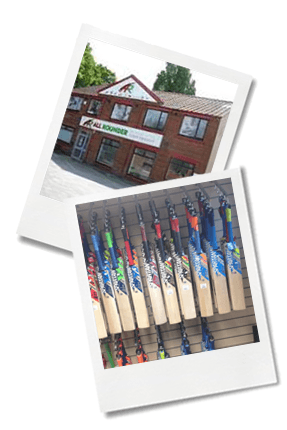 All Rounder Cricket is one of the largest cricket retailers in the World. Since our incorporation in 2011 we have grown rapidly to supply tens of thousands of cricketers on an annual basis with their cricket equipment and teamwear. Boasting a huge store opposite the world renowned Headingley Test Cricket Ground in Leeds, and our all new megastore in Sheffield which opened December 2015, plus a state of the art website, we send out thousands of packages per month to cricketers all over the World. We have invested heavily in technology, systems and stock to provide our customers with the ultimate cricket retail experience whether in store or on our website. Both in-store and online we have our expert teams on hand to help with any cricketing query you may have. Our Managing Director is an ex professional cricketer of 11 years and most of our customer facing staff play cricket to high levels providing unrivalled expert advice. We stock a full range of cricket equipment and teamwear for cricketers of all levels including bats, pads, gloves, bags, bowling machines, teamwear, shoes, sunglasses and much more. 1) We know what we are talking about – Run by ex professional cricketers we sell thousands of cricket bats a year and tens of thousands of products. We are a progressive company exemplified by our growth in the last four years. We are excited about the future of cricket retail and like to introduce innovation in both what and how we offer customers and also in the way the company is run. 1) SHARING OUR PASSION FOR CRICKET – Cricket is a passion, one of life’s pleasures. We want our customers to know how passionate and enthusiastic we are to each and every one of them. 3) DOING WHAT’S RIGHT FOR OUR CUSTOMERS –Being run by ex professional cricketers we will only sell products and services that we would use ourselves. We believe honesty and integrity is of paramount importance when servicing customers and treat them as we would expect to be treated ourselves. 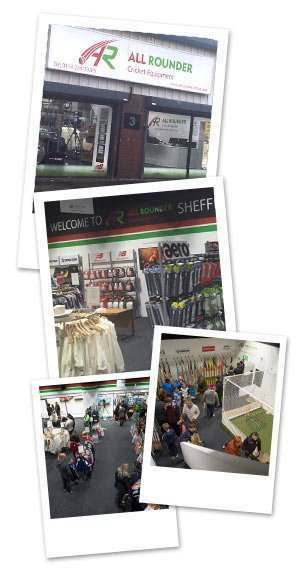 We have two megastores, our first store which is located opposite the world renowned Headingley Test Cricket Ground in Leeds and our ALL NEW Sheffield megastore which opened in December 2015 by the world's no.1 batsman: Joe Root is located at the Penistone Road Industrial Estate in Hillsborough. The new Sheffield store is one of a kind and provides a truly unique shopping experience. Including: Unique bat zone so you can try before you buy, packed with all the biggest brands and over 1,000 bats in stock, a teamwear room so you can try and order your teamwear kit, plus much, much more.